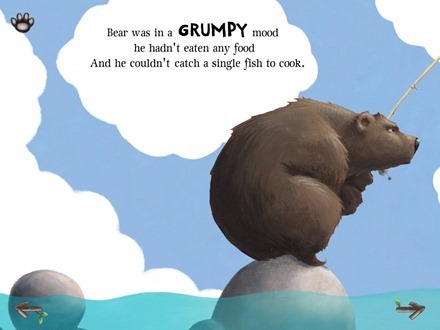 The Very Hungry Bear is a new iPad storybook app released on the iPad App Store this week. My 9 year old daughter (Zoe) and I are always looking for more good storybook titles so we grabbed this one a few days ago. 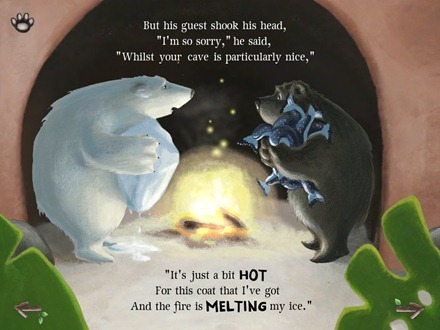 Apparently this title is the second in a series featuring this bear, written and illustrated by Nick Bland. We have not read the previous title, ‘The Very Cranky Bear’, but this story is fine as a standalone book, so I don’t think we’re missing anything by diving right into this title. 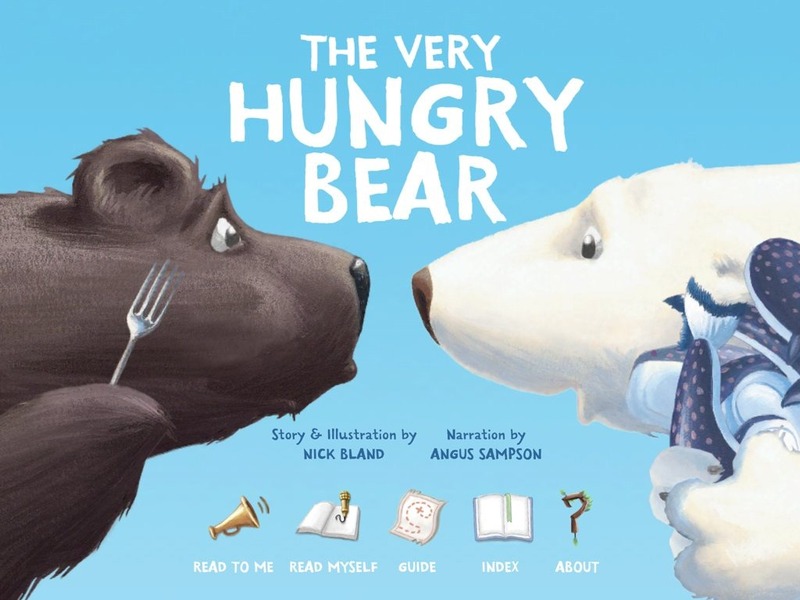 Bear returns in Australian author Nick Bland’s latest title, “The Very Hungry Bear”. He’s not so cranky any more – but this time his tummy is growling! 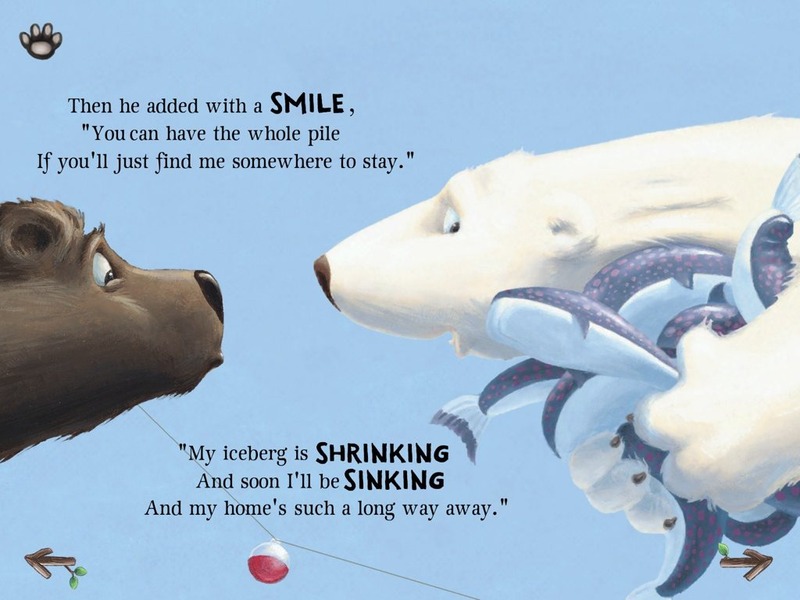 Go on an adventure with Bear as he tries to catch fish for dinner, and ends up finding new friends! Read aloud and record your own audio, or choose to have the book read to you by Australian actor, Angus Sampson. – Collect fish hidden throughout the book to unlock a SPECIAL SECRET interactive!! – Choose to record your own audio, or be read to! — The illustrations throughout the book are fun and attractive. They help to bring out the character of the two bears nicely. — The narration is very good. It goes perfectly with the lighthearted story being told in the storybook. — There are interactive elements on all the pages, which always adds an element of engagement and fun for kids, and one challenge (finding fish) that continues through the whole storybook. — The story itself is a good one. The themes of friendship, sharing, and looking out for each other are brought home nicely. It makes for a gentle, positive bedtime read. The rhymes throughout the story are well done too. — It gives you options to have the story read aloud, read it yourself, and to record your own (or your child’s) reading of it. — You can’t swipe to turn pages – you have to tap right and left arrow buttons to move forward or back within the book. I think it’s fine to include arrows as an additional option – but it always seems more than a little odd when you can’t just swipe through pages. The Very Hungry Bear is quite a nice story, with lovely illustrations. It’s a read for younger kids and an ideal sort of peaceful, calming it down mood around bedtime. I’m not sure it’s got much re-reading appeal for my 9 year old daughter – but I expect younger kids might like to enjoy it quite a few times over. Here’s an App Store link for The Very Hungry Bear; it’s priced at $3.99. Really enjoyed your blog on children’s literature. When my children were growing up reading was a major part of our lives. Last night there was a round table discussion on PBS about the direction of books (physical and digital). As an adult I only buy digital now; however, I think for very small children a tactile, physical book experience is still very important. The effect of the screen on young eyes is also a consideration. When the child is older I would expect them to be reading eBooks on an iPad Mini (or a comparable device that displays color). Books are evolving in the digital age, and I think the entire industry will only get better. I’m looking forward to buying the latest and greatest Apple device for my new granddaughter when the time is right. Thanks for the comment and glad you enjoyed the blog. I meant to watch that Charlie Rose show with that discussion last night and then forgot. I agree that the experience with a physical book is crucial. Our daughter loved books from a very early age. She loved holding them when she was tiny and I’m so happy that she still loves books now at 9. She’s a voracious reader, of real physical books – but also enjoys a good iPad storybook now an again.